UPDATE: In total six raven chicks hatched and grew up quickly. We loved watching them grow on our raven cam, which has been taken down now that they’ve moved on from the nest. They are still hanging around UTIG, so be sure to check our social media channels for any more photos. 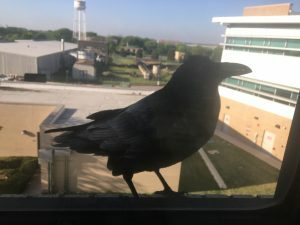 In the last month, ravens have made a nest across from our office at TACC. We’ve got a great view from our office and are enjoying watching the birds make their home. Their eggs recently hatched, we have counted five chicks in there. You can watch live on our Raven cam. Due to the technology we are using is may look a bit like slides than a video. It is mostly too dark for the camera overnight from about 8pm to 7am. Also, we are streaming via our mediasite and it may be down during our seminars or other activities that we need the camera for, but don’t worry, it will be back, just check back later.